Teeth whitening is an easy way to rejuvenate your smile. But what if you experience sensitivity from whitening? Something is wrong. Whitening your teeth should be a comfortable and enjoyable experience. Causes, treatment, and prevention of sensitivity or pain are discussed below. What Causes Sensitivity with Teeth Whitening? Untreated cavities get worse and affect the layers of your teeth. When decay begins to affect tooth pulp, which includes nerves, your teeth can become sensitive to heat, cold, and other things—including whitening gel—that come in contact with your teeth. If dental fillings or other restorations, including dental crowns, are not correctly sealed or bonded, bacteria and fluids can leak beneath them. The tooth pulp will become irritated. If you use teeth whitening gel while you have a leaking restoration, it can create even more sensitivity. Receding gums expose tooth roots. The roots can become sensitive to the touch and to temperature changes. Already sensitive roots can be further irritated with teeth whitening gel. If a tooth has a small fracture or other damage, bleaching gel can leak in and create sensitivity. Dentin tubules are small channels in the dentin, or middle layer of a tooth, that transfer sensations from outside a tooth to the inside. Although dentin tubules naturally have plugs, the chemical reaction during the whitening process opens the plugs. Some people experience sensitivity to the carbamide peroxide or hydrogen peroxide in teeth whitening gel as it flows to the tooth nerves. What Can You Do About Sensitivity from Teeth Whitening? There are varying strengths of whitening gel. You might get better results with a less potent gel. It might take a little longer to get your teeth as white as you want, but the experience will be more comfortable. Reduce the time you wear the bleaching trays. Shorter sessions can limit sensitivity in your teeth. Give your teeth a break. Avoid whitening them for an extended period of time, and avoid excessive treatment. Some types of toothpaste are designed to reduce sensitivity in teeth. You can use them before and after whitening sessions. Your dentist can provide you with desensitizing gel or paste. When you receive teeth whitening from a dentist, a desensitizing agent can be applied to your teeth before and after bleaching sessions. Some dentists ask patients to use desensitizing toothpaste up to two weeks before a whitening session. If you are experiencing prolonged sensitivity in your teeth, schedule an appointment with your dentist. He or she will examine your teeth and gums and explain your treatment options. Dentist-supervised teeth whitening provides safe, comfortable, and predictable results. Speak with your dentist about your options for a brighter smile. This post is sponsored by Lowell, MA accredited cosmetic dentist Dr. Michael Szarek. Teeth whitening provides a fast smile makeover. If your teeth are healthy and basically aligned, this treatment might be all you need to revive your smile. But too much of a good thing—including teeth whitening—can do more harm than good. What do we mean? Bleaching gel penetrates natural teeth, but it won’t remove stains from porcelain restorations or cosmetic bonding. Your natural teeth will get white, but the stains on your bonded or restored teeth won’t budge. There will be a noticeable difference between your natural teeth and those with bonding, veneers, or crowns. Stop whitening and see a cosmetic dentist. If your bonding, crowns, or veneers are stained, a skilled cosmetic dentist will recommend the appropriate treatment to improve the appearance of the restorations. It might be time to replace them. Bleaching gel will become an irritant if you have cavities or gum disease. As the gel seeps into the affected areas, you can develop an infection in your gums or teeth. Infected gums will need to be treated, and an infected tooth might need root canal treatment. Do you think your teeth are never white enough and you keep bleaching them over and over again? Stop. If you’re addicted to whitening your teeth, it can make them brittle and sensitive. They can become transparent or look gray in color. The pearly whites you always wanted can become totally unattractive. And with excess bleaching, the chemicals can burn your gums. Both your teeth and gums will become unsightly. If you continue to damage your teeth with bleaching gel, it might require cosmetic dentistry and gum treatment to restore your oral health. Dentist-supervised whitening yields the best results. If you decide to completely do it yourself, avoid cheap whitening gel. Ensure the contents of the gel are FDA approved. And whiten your teeth as instructed. If your teeth are already damaged by over-bleaching, schedule an appointment for an exam with a cosmetic dentist. Prompt treatment can prevent any issues from getting worse, and it can save you money in the long term. Most people would welcome the chance to have a whiter, brighter smile. But in the quest to get their teeth super white, some people use bleaching gel over and over again. Is it possible to over bleach your teeth? Teeth whitening can be fun and rewarding. But overdoing it can lead to sensitivity, pain, and some surprising but disappointing results. What are the effects of overdoing it? Tooth roots – Excessive teeth whitening can damage teeth and their roots. When teeth are whitened too frequently, damage to the tissue around them can create the need for root canal treatment. Also, too much whitening gel can cause chemical burns on your gums. Tooth enamel – Excessive bleaching can wear away tooth enamel and give your teeth a gray or blue hue. You can lose your super white teeth and cause them to turn dark and unattractive. In severe cases, cosmetic dentistry will be needed to conceal the dark color. Sensitivity in teeth – Some people who over-bleach their teeth have difficulty tolerating cold or hot food or drinks. Tooth nerves can become irritated and send radiating pain throughout your teeth. It is always best to check with your dentist before whitening your teeth. If you have cavities developing, the gel can irritate them. And in some cases, teeth whitening will make stains on your teeth even more noticeable. A cosmetic dentist can examine your teeth and anticipate the effects of the bleaching gel on your teeth and gums and let you know if it’s the right treatment for you. Everyone who whitens their teeth without the assistance of a dentist should take the necessary precautions to ensure the whitening gel used is FDA approved and not a cheap knock-off that will damage teeth. This post is sponsored by Lowell, MA cosmetic dentist Dr. Michael Szarek. Can I get my teeth white while I am wearing braces? I really should have gotten my teeth whitened before I got braces. I don’t know why I didn’t. I just kept putting it off. Thanks, M.A. M.A. – Yes, it is possible to whiten teeth while you are wearing braces, but it may be best for you to wait until your braces are removed. There are several factors to consider. Certain brands of teeth whitening have whitening trays that are made to fit over braces. The whitening gel will get beneath the braces to whiten your teeth, but it may not get beneath the brackets that are bonded to your teeth. When your braces are removed, your teeth will look patchy. Many dentists don’t recommend whitening your teeth while you wear braces. Many whitening products, including whitening toothpaste, scratch ceramic braces. 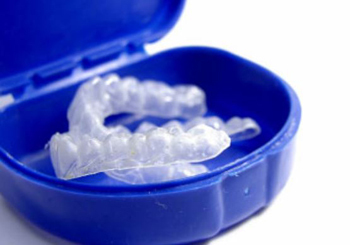 It is easier to whiten teeth during orthodontic treatment if you wear Invisalign. The invisible braces are easily removed, so whitening your teeth will work well and evenly. For patients who wear Invisalign, your dentist will tell you the best time to begin whitening your teeth. Speak with the dentist or orthodontist from whom you received the braces to determine if you are a candidate for teeth whitening. Do not try to whiten your teeth yourself without speaking with your dentist about it first. Your dentist will also give you tips on how to avoid staining your teeth while wearing braces. This post is sponsored by Lowell, MA dentist Dr. Michael Szarek. Yanika – If you received an invitation for a teeth whitening party with no clear information about the sponsor, beware. Examination – A dentist examines your teeth in advance of teeth whitening to determine if you are a candidate for it. For some people, bleaching gel makes stains in teeth more noticeable. Others experience a lot of sensitivity. Only an examination by a dentist can anticipate the results you will get from teeth whitening. Proper sanitation and monitoring – It is difficult to monitor a group of people who are getting their teeth whitened. Do you know who will be doing the whitening, and what will be used to whiten your teeth? Will the environment be sanitary for your oral health? Effective whitening – Professional treatment includes customized bleaching trays to keep the gel in contact with your teeth and away from your gums. There is no way you can receive custom trays at a four-hour teeth whitening party. Follow-up – Dentists schedule follow-up appointments to ensure the results are as expected and your teeth and gums are healthy. At times, more sessions are needed to ensure your teeth are as white as you want them. If you really want your teeth whitened, we advise asking your dentist or a dentist who offers it. This is the only way you can be reasonably sure that you will receive quality treatment.